Newer: » Kudos to the Flota girls! 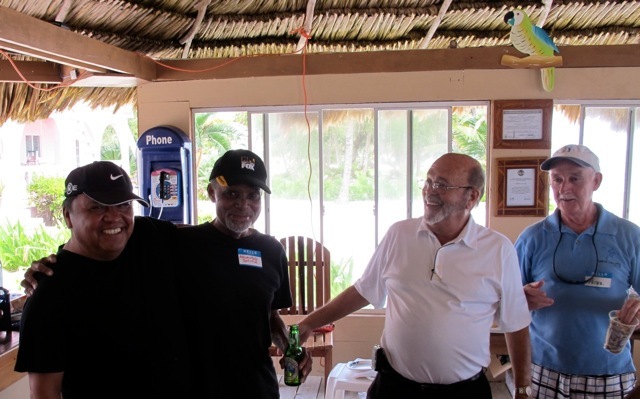 The South Ambergris Caye Neighborhood Watch group (SACNW) held its annual September potluck event on Sunday the 15th at the Caribe Island Resort. The gathering is a fun way for neighbors to get together in a social atmosphere and enjoy the beach, the company and some wonderful food. This year the food was plentiful and varied - and all gone by 2pm! Bob Utsman was kind enough to hold a Chinese auction and this event raised $325 in a short 15 minutes of laughter and daring. The happy winner was our very own Jan Brown from the Marco Gonzalez Archeological Reserve. The prizes were generously donated by Wine De Vine, the Black Orchid Restaurant and the Belize Chocolate Company. Guests included a handful of police officers that are always glad to assist SACNW in its endeavors. SACNW takes this opportunity to thank the Caribe Island Resort for graciously hosting this event. SACNW is a not-for-profit organization that is operated by the residents of the area. The next meeting will be held at the Black Orchid Restaurant on Wednesday October 9th at 7pm. If you live in the area or own a business or home between Victoria House Hotel and the southern tip of the island - we encourage you to attend and get to know your neighbors and learn about events in our area. Any other residents of the island that are interested in attending please feel free to stop by. We are happy to welcome you and will gladly provide information and support if you would like to start a similar program in your area of the island. Letter to the Editor: "Good Job Police!"